Below, I've included details on a few ongoing and completed projects. If you're a Siena student and want to gain some experience in evolutionary biology, computational biology, or DNA sequencing in the lab, please contact me! I am working with collaborators at the Field Museum (Julian Kerbis Peterhans and Terry Demos) to investigate the evolutionary history of small mammals of Subsaharan Africa. Our focus so far has been on the African Wading Rat (Colomys goslingi) and members of the genus Tachyoryctes. We are attempting to resolve taxonomic issues in this group, including the affinity of the Ethiopian Water Rat (Nilopegamys plumbeus) and west African Colomys populations. We are also studying how physical geography and climate changes of the past might have affected patterns of speciation. Within the mammalian family Soricidae (the shrews), the genus Crocidura contains over 180 recognized species, making it the most species-rich genus in all of Mammalia. Despite this incredible species diversity, morphological diversity is relatively low, and many of its most closely related genera are not nearly as diverse. What explains this disparity in species diversity? Why are there so many Crocidura species with similar morphologies, and how many undiscovered cryptic species might be present? I am working with Jake Esselstyn at Louisiana State University, along with his many other collaborators, to disentangle the species limits and species relationships in this poorly understood group. Ultimately, we hope to use phylogenies to address specific hypotheses about how climate and geography might have affected diversification in the tropics of Africa and Asia. Recently, we described three new species of Crocidura from Tanzania (Stanley et al. 2015) and used ultraconserved elements in a phylogenomic analysis of Philippine shrews (Giarla and Esselstyn 2015). Our latest work involved the description of a new genus of crocidurine shrew from the Philippines: Palawanosorex (Hutterrer et al. 2018). Siena student Kelly Moolick presenting on her Maxomys project at the 2016 ASM Meeting. I'm working with Jake Esselstyn and his collaborators to reconstruct the phylogeny of Maxomys. There are currently 18 recognized species of Maxomys distributed throughout Southeast Asia. Along with other mammal species from the region, many Maxomys species are under threat due to deforestation and climate change. Before this diversity is lost, it is important to understand how many Maxomys species are present and how they are related to each other. The trees inferred as part of this project can be used to reconstruct the biogeographic history of spiny rats, identifying, for example, the number of transitions between Mainland Asia and the Islands of Indonesia and the Philippines. Recently, we published a phylogeographic analysis of one Maxomys species from Sulawesi, Maxomys musschenbroekii, attempting to tease apart the various environmental factors that might be associated with population structure (Giarla et al. 2018). The cover of The Bulletin of the American Museum of Natural History, No. 346. Didelphid marsupials are among the oldest mammalian inhabitants of South America, but species limits and phylogenetic relationships in many didelphid genera are poorly known. Together with my Ph.D. advisor, Sharon Jansa, and collaborator Robert Voss (AMNH), I worked to revise the taxonomy of one particularly problematic didelphid genus: Thylamys mouse opossums (Giarla et al. 2010). With a robust taxonomy in hand, I focused on a subset of Thylamys species from the Andes to address hypotheses concerning cryptic species (Giarla et al. 2014) and the impact of Pleistocene glacial cycles on phylogeographic structure. In another study, I considered the relative impact of physical impediments to dispersal (e.g., mountains and rivers) versus ecotones (e.g., the ecological boundary between montane forest and high-elevation grassland biomes) in shaping the biogeographic history of Thylamys and its sister-genus Lestodelphys (Giarla and Jansa 2014). Differences in plantar morphology between (a) Thylamys velutinus and (b) T. macrurus (Fig. 13; Giarla et al., 2010). The climate oscillations of the Pleistocene likely had a profound effect on terrestrial mammals, and especially species that inhabit mountainous regions. I used a large, multilocus nuclear dataset to better understand how population sizes, population divergence times, and geographic ranges changed in six montane Thylamys lineages over the past 200,000 years. I used these results to test predictions about the effect of shifting climates on driving evolutionary patterns in montane species (Giarla and Jansa 2015). In 2010, I traveled to Argentina to survey small mammals along a transect from the lowland Chaco to the high desert in the far north of Argentina with Dr. Gabriel Martin from the University of Patagonia. See pictures from my trip below. 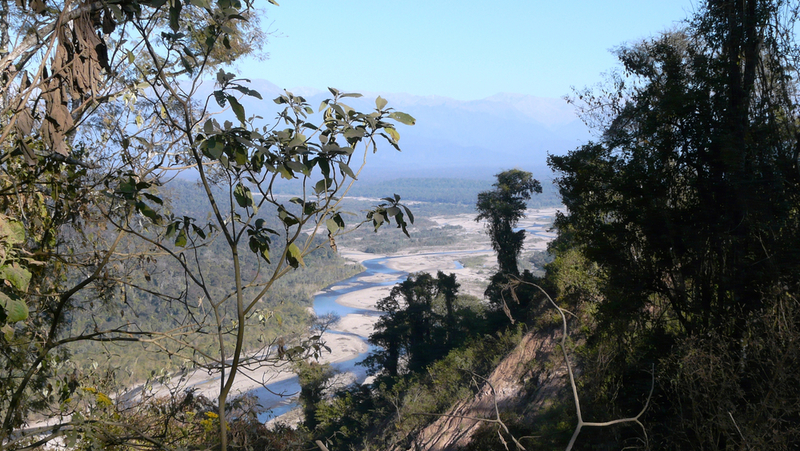 A view of the Iruya river from the Andean foothills about 25 miles northwest of Orán, Argentina. A secluded creek near the town of Isla de Cañas, Argentina (600 m. elevation). We trapped numerous rodents and marsupials in this area. A Toco Toucan (Ramphastos toco) forages in a tree the town of Isla de Cañas, Argentina (600 m elevation). Crossing a branch of the Iruya River--this is only possible during the dry season! Silt-laden water comes together with clear water near the town of Isla de Cañas, Argentina (600 m elevation). Tropical Parula (Parula pitiayumi) perched in dry vegetation in the town of Isla de Cañas (600 m elevation). 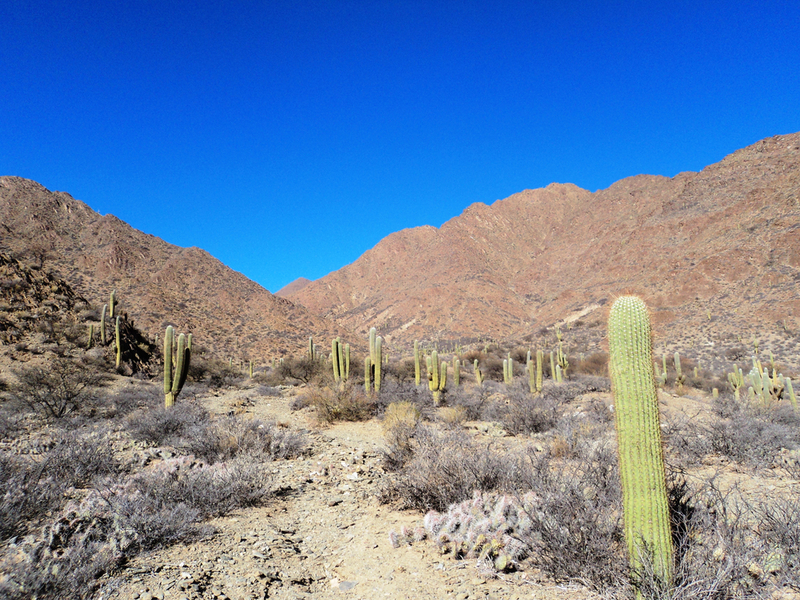 The high desert near Cachi, Argentina (2500 m elevation). Moonrise over the high desert near Cachi, Argentina (2500 m elevation). A guanaco (Lama guanicoe) in the Parque Nacional Los Cardones near Cachi, Argentina (2500 m elevation). Mountain road outside of Cachi, Argentina (2500 m. elevation). An abandoned truck in the lowland chaco village of Dragones.